NFL is endorsing its own official tailgate party held just before the kick-off at the Meadowlands Racetrack’s Grandstand. If you really want the tailgating experience during the 2014 Super Bowl, then you can just cooperate with Kelly and go to the Official NFL Tailgate Party at the Meadowlands. There will be a party three hours before the game and another one two hours after. These parties are hosted by the NFL. This is just as big as the event itself, as it is one of the highlights of the big game. During this party, there will be delicious food stations. Also, high quality liquors will be served. Besides the food and the drinks, there will be big time entertainers who will have fun with the fans. In 2013 One Republic and Matchbox Twenty performed in the Official NFL Tailgate Party. For people who do not have access to NFL sanctioned parties in Meadowlands Racetrack or the Izod Center’s NFL On Location, then they can join East Rutherford’s very own “Gameday Tailgate- Live from East Rutherford.” This tailgate party is one way for people in East Rutherford to let everyone know that they really are hosting he 2014 Super Bowl. According to East Rutherford’s council president Joel Brizzi, this non-NFL sanctioned tailgate party is still in its planning stages. Rutherford and Secaucus will also have their own tailgate parties. According to Brizzi, the pre-game tailgate will definitely start at about 4:30 p.m. on February 2, 2014. Brizzi said, their borough has something that others don’t, and that is they have the Super Bowl. According to some town officials, planning their own tailgate party is difficult, especially considering the fact that NFL will also conduct their own tailgate event. One challenging part of organizing an event under the shadows of the NFL brand is that they can’t use “Super Bowl” in any names. Gameday Tailgate- Live from East Rutherford is going to be the biggest tailgate party available for the ordinary folks, said Ron Simoncini, president of Axiom Communications, which is one of the firms that represent the tailgate event. He said, some of the main attractions of this event include a nationally famous music act. There will be food served during the party too, food which East Rutherford is very famous for. If these features are not enough, there will also be food trucks, band, heated tents, and a snowball-throwing contest. You will fall like a true Meadowland resident with this event. This is an amazing thing for those who do not have any Super Bowl 2014 ticket at all. There will be a nominal door fee, but no amount has been divulged yet. Besides East Rutherford’s Gameday Tailgate event, people can also have their own tailgate party all the way from New York. Bullseye Event Group will hold their own pre-party with their Super Bowl Players Ultimate Tailgate, which will be held on February 2, 2014. The party will begin at 11 a.m. and will run up to 4p.m. With chef Marcus Samuelsson or Red Rooster Harlem is catering the event. Bullseye Event Group is an outstanding sports, event and travel company. Over 20 archived NFL players will also be in the event. Harlem Gospel for Teens Choir will entertain the fans during the Super Bowl Players Ultimate Tailgate. Anheuser-Busch InBev will transform a Norwegian Cruise Ship into a floating New York/New Jersey entertainment and lodging party venue. From January 30 to February 2, 2014 at the Hudson River Anheuser-Busch InBev’s “Bud Light Hotel” will set sail. This cruise ship can hold a capacity of up to 4,000, almost 10-times larger than the previous one. Bud Light Hotel will be docked at Pier 88. Bud Light president Rob McCarthy said they have decided to go bigger than they have ever gone before with the Bud Light Hotel. 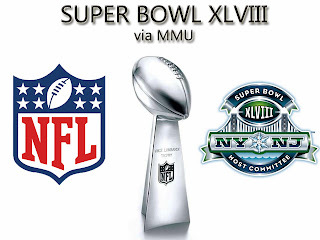 People can lodge the ship on Thursday, before the Super Bowl 2014 on Sunday, February 2, until Monday. McCarthy said this will be ten times bigger than their traditional hotels, which means they will be having not only retailers and consumers, but their business partners as well. Bud Light Hotel is definitely one of the most extravagant Super Bowl 2014 events. Besides the giant Anheuser-Busch InBev, Shape Magazine and Men’s Fitness magazine will also host a pre-Super Bowl party on January 30. They will conduct a shindig with famous names including Marc Anthony, Mary J. Blige and John Legend. DirectTV is also planning its own big time pre-game party on February 1 in the afternoon with a beach theme and another at night with a sophisticated theme. DirectTV marketing senior vice president Jon Gieselman said New York’s standards is very high, that they have to compete with other companies and the rest of what New York has to offer. Maxim also announced that they will have their own pre-party. Maxim president Ben Madden said his firm is also planning their own Super Bowl 2014 parties which they will definitely bring to the next level. There will be so many more pre-party for the Super Bowl 2014, some are extravagant and exclusively for those who can afford, while a lot are also public. One thing is for sure, NFL fans will never run out of options on how to watch the big game.